THE STORY - During World War II, a Jewish worker (Géza Röhrig) at the Auschwitz concentration camp tries to find a rabbi to give a child a proper burial. THE GOOD - Extreme realism with a documentary eye and immersive sound design. THE BAD - Shaky handheld camerawork can be dizzying. Debut director/writer Laszlo Nemes wastes very little time in his Hungarian film "Son Of Saul" setting the audience up for what they are about to see. He is well aware of the large amounts of Holocaust Dramas to come from the Hollywood system for decades and is looking to subvert audience expectations to bring them something new that they have never seen before. The opening shot starts out of focus (I actually thought there might be a problem with the projection at the theater I was attending), then it slowly comes into focus as the lead character Saul (Played by the first-time actor Geza Rohrig) approaches the frame. It's a bold statement from Nemes saying that we need to forget about all depictions of the Holocaust caught on film before, as he slowly brings into focus what it must've really been like during this terrible time in human history. The Academy Award nominated Best Foreign Language film takes place in the famous Auschwitz concentration camp in 1944. It follows a Hungarian prisoner who is part of the Sonderkommando (A member of the work unit for the concentration camps that was in charge of disposing of the bodies of those who were murdered). The film takes place over the course of a day and a half as Saul realizes that one of the victims from the gas chambers appears to be his son. He sets off on a daring mission to find a Rabbi amongst all of the chaos who will give his son a proper burial. His plight will come into conflict with those in the camp who are trying to survive another day and possibly plan a resistance in hopes of escaping their doomed fates. I realize that the older I get, the harder it becomes for me to watch films such as these that deal with such inhumanity. Perhaps it's because I'm more aware of the inhumane atrocities taking place in other parts of the world. That knowledge (And the knowledge of our past) fills me with sadness as to why I was so lucky to not be born in times or places of great cruelties and evil. Films such as "Son of Saul" not only exist as a reminder of those previous horrors but also as a warning for the other horrors that are occurring and what is to come. Suffice to say, "Son of Saul" is not an easy sit for a casual viewer. It's bleak and undeniably realistic in its portrayal of the day to day workings of what it must have been like to live in the Auschwitz concentration camp during this time. This is not to say "Son of Saul" is a graphic film in the gory sense. 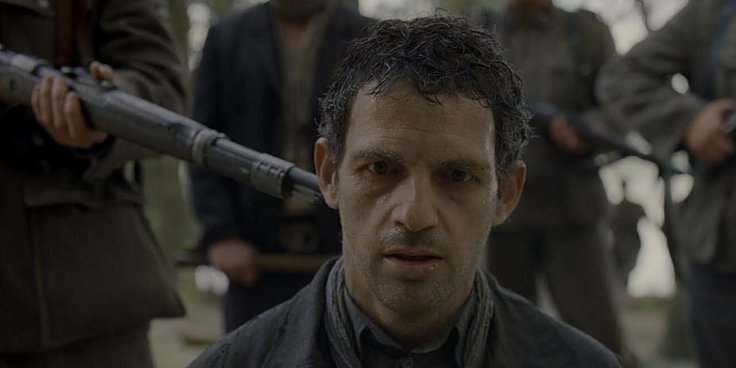 While there are moments of violence, "Son of Saul" is hauntingly beautifully well-made film which is all the more shocking since it's a debut film from Laszlo Nemes. If there was one word I would use to describe this film it would be "immersive." Nemes style is to shoot actor Geza Rohrig (Who is fantastic here) in extreme close-ups (Either in front or behind), allowing for his head to fill up a majority of the frame. We see the world around him just as he sees it. We also hear so much that is going on around him. The sound work here is impeccable in allowing us to imagine what is happening off camera. The cinematography by Matyas Erdely follows Saul throughout the film in some very impressively staged long takes that fully help to engage the audience and let them absorb the rush of emotions that are occurring. All aspects of production are bringing their A-game to this project under the guidance of Nemes's original take on the material. However, there are a few drawbacks. Sometimes the camera shakes around too much and disconnects the viewer from the immersive experience that is so skillfully taking place. The pacing may also leave a lot to be desired from the less patient moviegoer. And there is an aspect of the screenplay that deals with the true nature of Saul's relationship with his son that left me more puzzled than emotionally involved. But let's not harp on these negatives too badly here. "Son of Saul" is still a startling achievement, one that Laszlo Nemes should be proud of and one that I feel will win Hungary the Best Foreign Language Film Oscar.